Covent Garden is at the heart of London’s ‘Theatreland’ and, as a true foodie destination, Covent Garden Restaurants feature some of the best pre-and post-theatre dinner options in the West End. 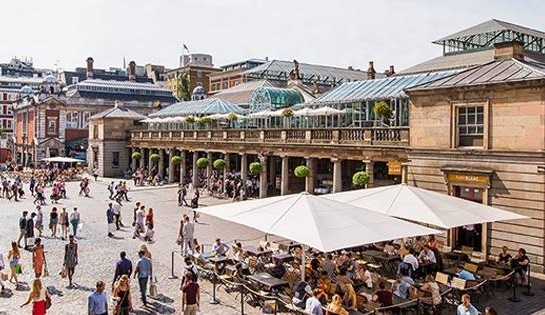 In the first of our Insights series, Theatre Breaks went to talk to the Covent Garden Insider to get their top five favourite restaurants in and around this famous square. If you’re feeling peckish, why not have a delicious pre- or post- theatre meal before or after your show. Clos Maggiore has won a clutch of awards for being London’s most romantic restaurant. That’s quite a claim, but believe the hype. See its full pre-theatre menu here. Price: Two courses for £24.50, or two courses plus ½ bottle of pre-selected wine for £29.50. Three courses for £29.50, or three courses plus ½ bottle of pre-selected wine for £34.50. When: Monday to Thursday from 5pm-6pm. Friday and Saturday from 5pm-6pm. Sunday from 5pm-10pm. When the famous, celebrity-packed, restaurant, The Ivy asked its regular customers what they’d like from a second restaurant, they requested the same tasty menu with speedy service so they could refuel pre- and post-theatre. Et Voila! See its full pre-theatre menu here. Price: Two courses for £16.50, or three courses for £21. When: Monday to Friday from 5pm-7pm and from 9:30pm-11:30pm. Gregory Marchand’s hugely popular Frenchie echoes its Parisian counterpart with simple and generous, yet precise dishes heavily influenced by his travels from London to New York through Spain and Hong Kong. Price: Two courses for £22, or three courses for £28. When: Tuesday to Saturday from 12-2:15pm for lunch and 6-10:30pm for dinner. Enjoy bistro food, good wine and friendly service whilst feeling like you are in downtown New York. See its full pre-theatre menu here. Price: Two course for £17.50, or three courses for £22:50. When: Monday to Friday from 12noon-4pm. Monday to Sunday from 5pm-6:30pm and 10pm. Two culinary traditions – Sushi and Yakitori from the charcoal grill are come together in Sticks ‘n’ Sushi. Discover why it become something of a phenomenon on the Danish restaurant scene by visiting its restaurant on Henrietta Street. Price: Set meals start from £19.50. When: Monday to Saturday from 12noon-11pm. Sunday from 12noon-10pm. We’ll be talking to the Covent Garden Insider a few more times over the next few months, to find out more about what this extraordinary destination has to offer in the way of eating, shopping and entertainment. But in the meantime, why don’t you download ‘The Pass’, Covent Garden’s smartphone app which unlocks special offers, content and services at almost 50 different shops and Covent Garden Restaurants. A lot has changed in Covent Garden since Eliza Dolittle sold flowers to passing gents in the famous musical, My Fair Lady so we really do recommend you coming to check the old place out! If you fancy a spot of retail therapy before you eat, Covent Garden is one of London’s hottest shopping destinations. From Chanel to Apple, Burberry to Dior, it offers world-class shopping and the best in beauty. Floral Street is home to designer boutiques, including Paul Smith, Mulberry, Orlebar Brown and Agnès b. On Henrietta Street, the likes of Nigel Cabourn, The Real McCoys, Club Monaco and Fred Perry offer the very latest in men’s fashion. While King Street is home to luxury stores including Burberry Brit, Galeria Melissa, Sandro and Jo Malone. Choosing a Musical to do at School or for a Youth Group?